Nasturtiums may survive very light frosts, but they are easily damaged by freezing temperatures. Apple, Beans, Cabbage, Kale, Broccoli, Potatoes, Pumpkin, Radish, Squash, Sweetcorn, Tomato and Sunflower. 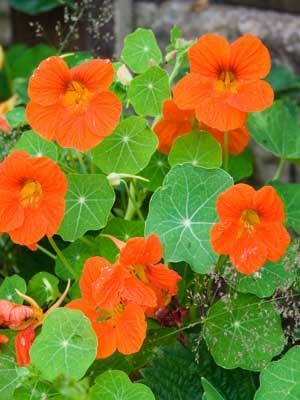 Nasturtiums sprawl out over the ground, so they suppress weeds and shade the soil when grown near tall plants like sweet corn, tomatoes or sunflowers. Soaking seeds in water overnight prior to planting may speed germination, but nasturtium seeds sprout best when the soil is warm. Poke seeds into the soil about 1 inch (3 cm) deep and 3 inches (8 cm) apart. Thin to 12 inches (30 cm) apart in all directions. Nasturtium blossoms, leaves and immature green seed pods are edible. Gather nasturtium blossoms in the morning, when they are plumped up with moisture. Snip away the base of each blossom, which may taste bitter. Nasturtium will often reseed itself in hospitable sites.